Ken Kharbanda is a Managing Director at Metropolitan Partners Group. He oversees portfolio company activities, operations and strategic growth initiatives. 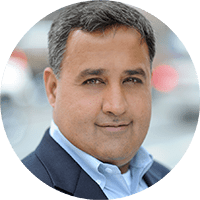 Ken has held leadership, governance and advisory roles across private and public companies for more than 25 years, having turned around, grown, raised capital for and sold companies in numerous industries, including specialty finance, telecom and e-commerce. Throughout his career, he has completed more than 40 transactions as an operator, investor or advisor, including raising over $2 billion in debt and equity financings (private and public) and completing more than 20 acquisitions and divestitures. He has also led separate company build ups across different markets, including growing KGB’s new e-commerce unit to $80 million in sales and increasing the sales volume at Biz2Credit, a fintech lender, from $10 million to $120 million. Earlier in his career, Ken spent more than a decade in various positions within the finance industry, including working for Bain & Co. and GE Capital. He earned his B.S. degree in engineering from Massachusetts Institute of Technology and received his M.B.A from Harvard Business School. Ken has also been on the board of 15 technology and services businesses, including Jostens, Beverage Media Group, Urban Fetch and Schoeller Allibert.